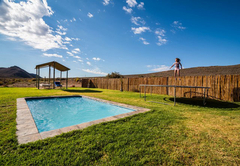 Jagerskraal Guest Farm is a highly recommended property providing self catering in Laingsburg for tourists visiting the Karoo region. 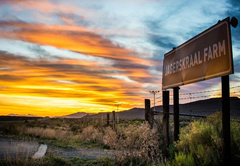 Jagerskraal Farm is two kilometres from the gate on the N1. 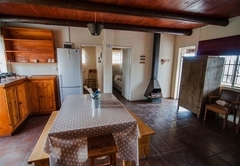 Jagerskraal farm is a guest farm with a fully operating farm. 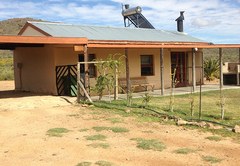 We don't have Eskom electricity and make use of gas for hot water as well as solar panels for hot water and electricity. 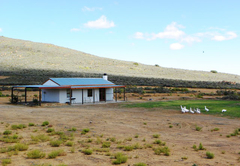 The farm offers five fully furnished self-catering chalets in a valley in the Karoo, completely surrounded by mountains. 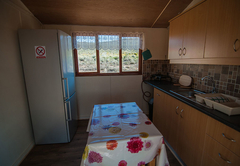 The kitchens are fully equipped and have a fridge-freezer and gas plate stoves. We provide all kitchen utilities as well as bedding and towels. 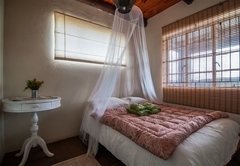 The accommodation is ideally suited for people who just want to have a break from it all. 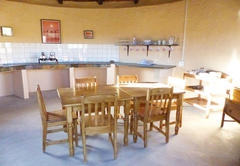 We are fully self-catering, braai and cooking facilities are at each house, guests to bring own food, and necessities. Wood is sold and is subject to availability, guest can bring own blitz and wood if they like. 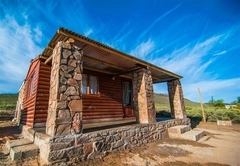 For those who prefer a more rustic approach to holidays, we also have our four informal wooden cabins available. 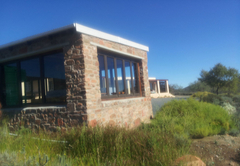 The cabin's are named after local antelope: Springbok, Duiker, Blesbok and Ribbok. 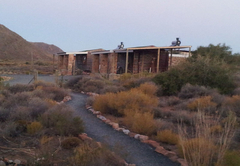 The cabins sleep 2 people each (two contain double beds and the other two contain two single beds each). 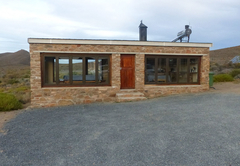 There is a fully equipped shared kitchen and the ablution facilities, with showers, are available at the conference venue. 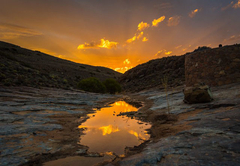 For the nature enthusiast, 27 plant species have been identified on Jagerskraal. We are also excited about our permit which will soon allow us to sell proteas, South Africa’s national flower, directly to the public at a very good price! 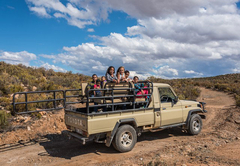 When driving on the 4x4 routes through the farm, guests can see small game such as steenbok duiker and Vaal ribbok as well as springbok, black wildebeest, ostriches and blesbok. 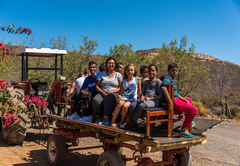 Guests are also welcome to handle the farm animals, such as chickens, ducks, pigs and sheep under supervision of the staff and at their own risk. 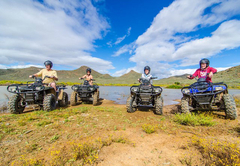 For the more adventurous there is horse riding or donkey cart riding and game drives on quad bike. Please note that the game drives will be taken at your own risk. 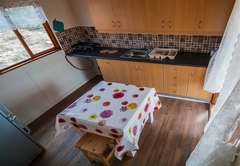 A one bedroom wooden cabin with a small kitchen and a dining area. 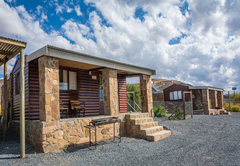 The cabin has a large en-suite bathroom with a shower. 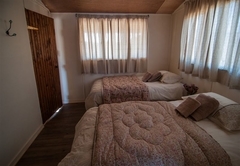 Cozy and very clean cabins, a place where you can relax but still enjoy yourself! We were warm wellcomed by our host Shayne on his quad accompagnied with Booma, a shepherd dog. Immediately the girls felt in love with the dog. 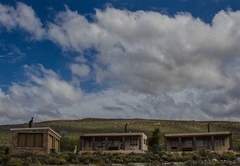 From the terrace in front of our house we had a wonderful view over the rolling hills of the Karoo. The hosts had pepared a wonderful braai at a remote spot on the farm area. We were trasported there standing on the back of the landcruiser. 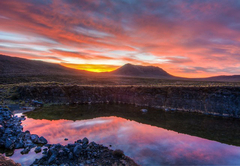 Very spectacular. The next day Shayne made a farm tour with us and explained everything. It was a great stay!